Nintendo has been having a bit of a tough time communicating just what the Wii U is all about. In particular, the company still seems unable to clearly articulate just why the Wii U's gamepad—a combination game-controller and touchscreen—makes their system worth buying. Perhaps, Nintendo president Satoru Iwata suggests, it's time for some new ideas. In an E3 analyst briefing recently translated and posted to Nintendo's site, Iwata explains the problems they've come across when selling one of the Wii U's most important features: Asymmetric gameplay. Asymmetric gameplay, or the potential for it, is one of the neatest things about the Wii U. You can play local multiplayer games without needing everyone to see the same screen. Therefore, it's possible to play games like some of the minigames included in Nintendo Land, where, say, one player will control a ghost via the controller's screen, invisible on the TV. Meanwhile, four more players will run around on the TV screen trying to find him. But when it comes right down to it, "asymmetric gaming" is a mouthful. It's convoluted and conceptual and requires an explanation like the one I just wrote for anyone to understand it. It's much easier to understand if you just play Lugi's Ghost Mansion, the minigame with the hide-and-seek rules I described above. Iwata says that Nintendo had hoped that Nintendo Land would communicate the benefits of asymmetric gameplay, but that while "we have received a lot of comments from consumers that the gameplay in 'Nintendo Land' is interesting. … we presume that they have not yet come up with the best words to easily explain how interesting it is to other people." "I would say that 'Nintendo Land' has not fulfilled the same role as 'Wii Sports' did when we bundled it with Wii," Iwata continues. Wii Sports, of course, being the game that so effortlessly communicated what made the Wii's motion controls special, and instantly made the case for owning the system. Of course, we won’t remain silent and do nothing. We are going to release a variety of Wii U software, and with each title, we would like to show how convenient and delightful it is to have the Wii U GamePad controller, and how it changes the gaming experience. In addition, we have also learned that the name “asymmetric gameplay” does not fully explain the GamePad’s value to consumers. As for the software going to be released from now on, we would like to describe the experience that the GamePad provides with a different expression in order to adequately convey its necessity to consumers and increase the number of consumers that think, “Indeed it is good to have a GamePad.” In this sense, starting with “Pikmin 3,” we aim to include functions that make good use of the GamePad that consumers can appreciate. Ha. 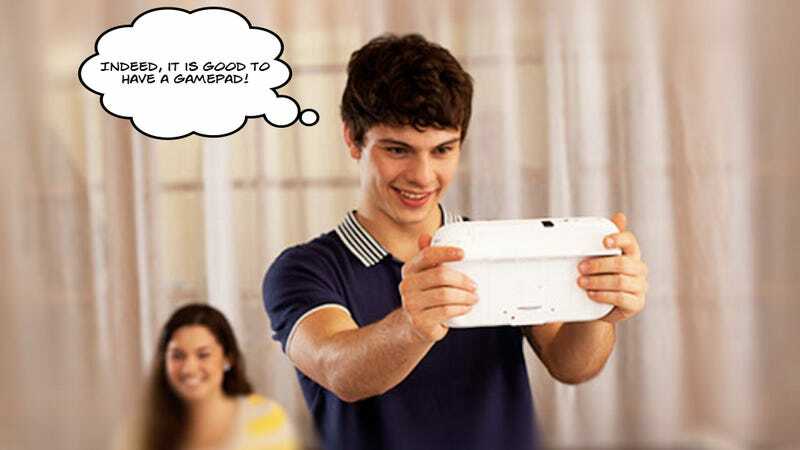 "Indeed it is good to have a GamePad" is actually something I think fairly regularly, usually when I'm playing something using the system's nifty off-TV play. But I agree that it's not very easy to communicate why asymmetrical gameplay is cool, particularly when you don't quite have that one amazing game—that Wii Sports—to help make the case. I put it to you: If Nintendo drops the term asymmetric gameplay, what term do you think should replace it?